Rococo were Melody Maker battle of the Bands finalists in ‘74 (under the name Brats) and Follow That Car is a glorious and deliciously overblown production with shimmering Lexicon reverbs and real LOUD car engine noises. It ends up as some form of Spector, Beach Boys and Progressive Glam (PRAM) hybrid. Some of the vocal inflections even recall Shirley Bassey !!!! 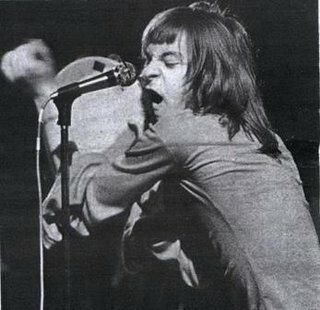 and the keyboards could have come off late Eighties Brian Wilson solo work. Not sure why I love it so much and keep returning to it, but I do -Play it bloody LOUD! 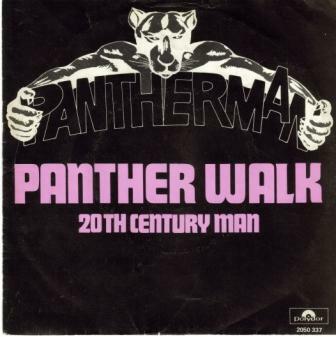 Frank Klunhaar returns and stars in the further adventures of Pantherman with Panther Walk. Although it sports a suitably tribal Bo Diddley beat and a funky clavinet, Panther Walk smells like an uninspired sequel. 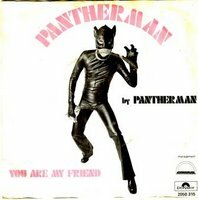 It certainly lacks the single-mindedness, drive, hook and dare I say outright joyous stupidity of the first Pantherman single. Whereas Frank played all the instruments on the previous single, it sounds like he has a band backing him this time around. Don’t get me wrong it’s still good stuff, but after such a glorious first single, it’s hard not to feel disappointed. 20th Century Man is somehow more intriguing with it’s dead modern jet engine noises and it certainly has a better tune. Not sure if this is going to be everyone’s bag, but in my opinion this is one of the most remarkable and truly insane releases from the Seventies. Mad Charles is a tin-helmeted Superhero (the world’s first karate robot!!!) who wreaks untold violence on the A side but gets all tender and squidgy on the B side. Greg Shaw may have coined it perfectly in an RPM review by calling it Garbage Psychedelia… I could even go one further and just call it plain retarded! 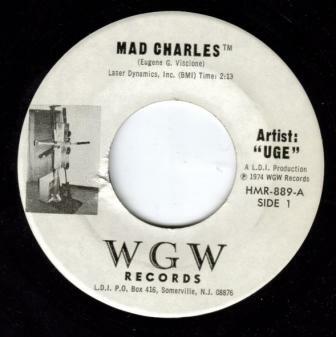 Not sure who UGE is, but the label was based in Somerville, NJ and the credits indicate that this is a Laser Dynamics Inc production- there's even a picture of a laser machine on the label! Thanks and curses to Collin for turning me on to this one! Now the really scary part: There may be another “B” side to this single entitled Sophie The Polish Chicken Hen. 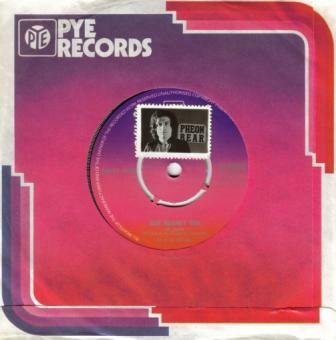 The flipside on this release has the letter C following the catalogue number, so in fact it may only be the C side… God forbid if there’s an unreleased album in the vaults of some derelict laser factory in New Jersey! 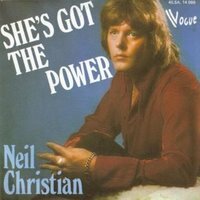 With a couple of copies of this single recently selling on ebay, it seemed a good time to upload a sound clip of this great single. Below is my original review. It has since been pointed out to me that that it sounds a lot like Jesse Hector and I couldn’t agree more…Enjoy! 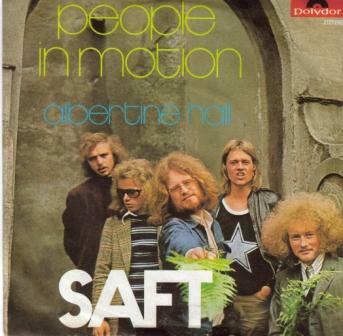 Saft were a Norwegian band from Bergen. 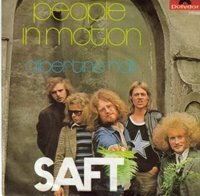 I’ve never heard their other releases, but People In Motion sounds just like a late 60s Kinks outtake (it could have easily come off Arthur…). 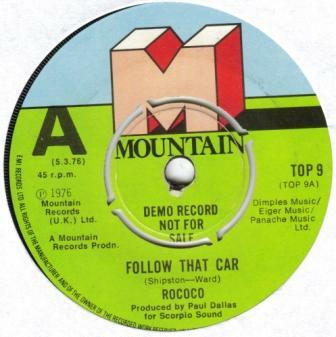 It sports a mighty fine tune, has a driving beat and the Mick Avory-like drum break precedes a cool instrumental dirge that is pure Muswell Hill. 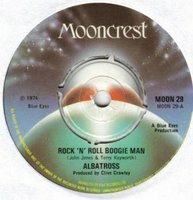 The B side Albertine Hall is also very accomplished and sits somewhere between Procol Harum and Badfinger, but lacks the bounce of the A side. Loud and totally crazy with one hell of a gimmick. 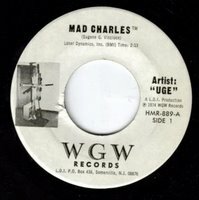 This single is up there with the weirdest and best of what the 70s could offer-Yes, I’m talking Grudge and UGE (more about that one soon). The track is a raging Punk/Glam classic and could give Hector a good run for their money. The vocals come across like Bryan Ferry’s disturbed twin who was sectioned at birth and locked up with Billy Hamon and the lyrics…well not sure what to say except ENJOY!Frank released 2 more singles under this pseudonym (Panther Walk and One Man Band, both on Polydor), I hope to be able to report on these as soon as they eventually come in. 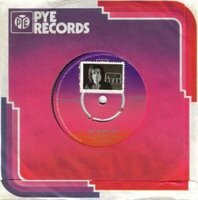 Click on title to hear Pantherman in its full glory…Enjoy! Another interesting Dutch release. 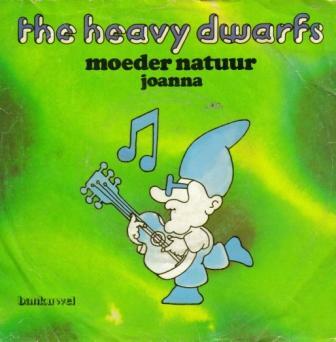 Moeder Natuur is a chomping Heavy Glam number, with fuzz guitars, slap-back/flanged drums and a few scattered HEYs, but it lacks that killer hook or tune to make it really stand out. I’m wondering if the band were in fact bank tellers? The back of the sleeve lists 4 different saving banks with full addresses and phone numbers…and the record label (Bankuwel) could well be an investment venture or something. Perhaps our Dutch friends could fill us in with some background info? 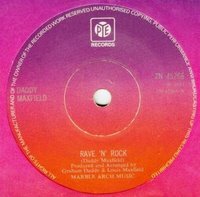 Rave ‘N’ Rock is one of the most widely loved Junk Shop Glam singles along with Iron Virgin’s Rebels Rule, Hector’s Wired Up and Mustard’s GoodTime Coming and it certainly deserves its reputation. The track is ROCK solid, but there’s also something strange going on with the meter and with the way the different sections overlap. I’m unsure if the track was recorded in the UK or if it was an US licensing deal, but the sound is the essence of the best of UK Glam. Daddy Maxfield were Louis Maxfield (AKA Lou Natkin) and Graham Daddy. They also released You’re Breaking My Heart/ Oh My (Rhino) and were on the periphery of the LA Punk scene. Prior to that, they had deal with UA who put out the Northern Soul collectable I have Always Been In Love With You which recently went for over $600 on ebay!!!!! I’m glad to say that I found this single for 40 pence in a car boot sale –Just the way it should be…even if it crackles a bit!